The start of Naha Marathon is nothing less than impressive as 25,000 runners take on the course from Meijibashi bridge on Highway 58 outside Onoyama Park in Naha. 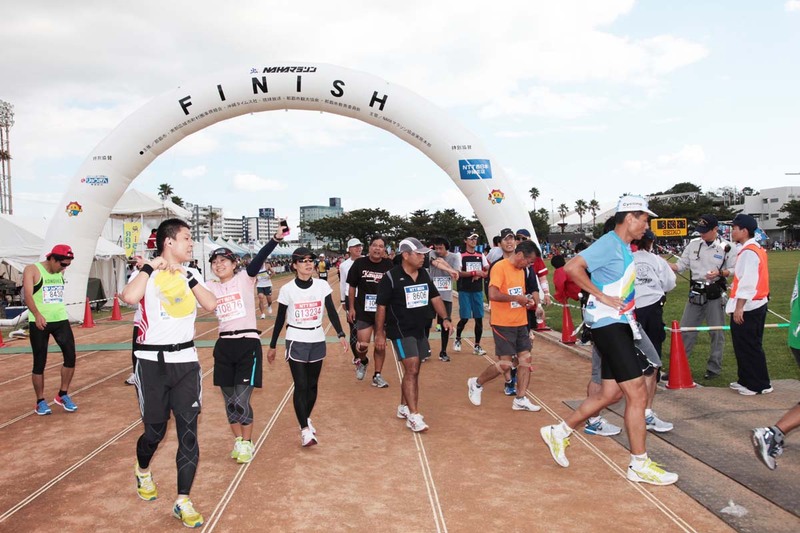 A marathon begun 28 years ago as an event linking sister cities Honolulu and Naha has become Okinawa’s premier event, attracting more than 26,000 runners to the challenging—yet tranquil and colorful—route spanning the southern third of the island. 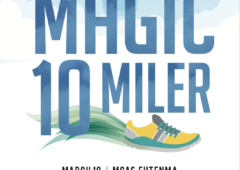 The 28th annual Naha Marathon kicks off Sunday at 9 a.m. from Meijibashi Crossing at Highway 58 just south of the capital city’s business district. The quota for this year’s event is 25,000 runners. 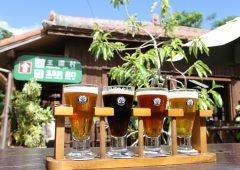 The 42.195 kilometer-long trek winds its way through Kohagura, Haebaru, Tomigusuku and Yaese Town on the outbound leg, passing lush farmlands en route to Peace Memorial Park, the race midway point at 21.3 kilometers. The return to Naha takes runners through Nashiro, Itoman City, Onaga and Nakachi on the way back to the finish line at Onoyama Park. 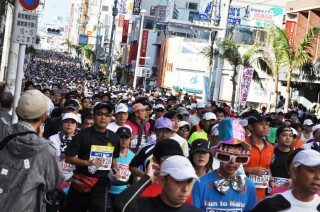 The first few kilometers of the race course wind through streets of Naha and circumstances can get a bit crowded. 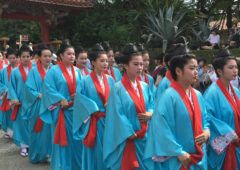 banner of “Festival of Sun, Ocean and Joggers.” It began in commemoration of the 25th anniversary of the sister city bond between Naha and Honolulu, with each successive race providing a forum for domestic and international interaction. The race starts from Meijibashi, at the crossing with Highway 58, at 9 a.m. It finishes at Onoyama Stadium. Runners have a maximum of six hours, 15 minutes to complete the route. Clear skies with a 30% chance of thunderstorms are forecast for Sunday’s race, with 23C predicted at starting time, and a high of 26C. The maximum allowable number of 25,000 runners are registered to race, somewhat fewer than the 26,268 who stepped off the starting line in last year and 26,973 in 2008. A total of 23,448 completed the marathon. Overall, nearly two-thirds of last year’s runners completed the course, including 44% of the 6,555 females. 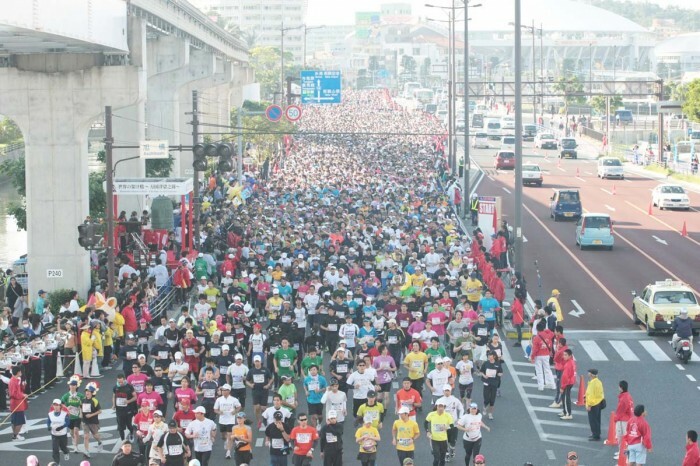 Race organizers say they expect non-Okinawans, including foreigners, to be about the same as last year when 7,231 traveled from mainland Japan to participate, as did 293 from overseas. 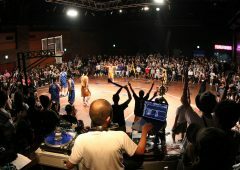 Runners have 6 hours and 15 minutes to complete the course, and cross the fininshing line in Onoyama. 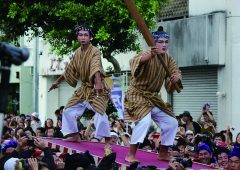 A Kyoto man and a Tokyo woman stood atop the victory pedestal in Naha last year, first time winners of the Naha Marathon. Both the men’s and women’s winners from the 2010 Naha Marathon couldn’t find the right strides, both finishing minutes behind the leaders to finish in third place. 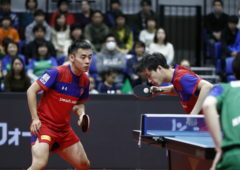 Kenshi Oonaka of Kyoto easily outdistanced Yuki Murato of Kanagawa to finish more than three minutes ahead with a time of 2 hours 25 minutes one second. The 2010 winner, Kouji Hayasaka of Miyagi, placed third with a time of 2 hours 29 minutes 28 seconds. 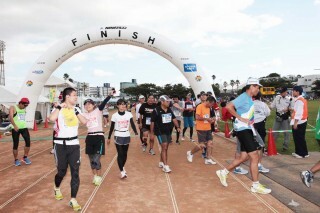 On the ladies side, Yuka Aikawa of Tokyo was smiling in the December afternoon Okinawa sun as she claimed her prize after winning the 2011 Naha Marathon with a time of 2 hours 58 minutes 4 seconds. Second place went to Okinawan Natsuki Murata of Urasoe with a time of 3 hours 4 minutes 56 seconds. 2010 winner Tui Takaiwa of Ibaraki was a half-minute behind that, finishing third with a 3:05:33 time. A total of 23,988 runners began last year’s Naha Marathon from Onayama Park—17,473 men and 6,515 women—but only 71.11% finished the grueling 42.295 kilometer course, a total of 17,038. 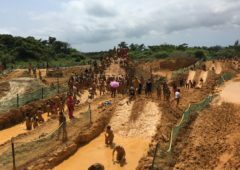 That figure, 13,098 men and 3,969 women, was slightly below last year’s completion percentage of 71.98%.